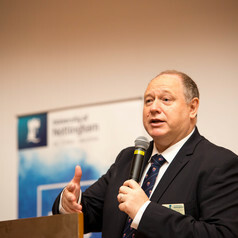 I am a Professor of Computer Science at the University of Nottingham (UK). I am currently the Provost and CEO at our campus in Malaysia and also a Pro-Vice Chancellor of the University. I am Editor-in-chief of the IEEE Transactions of Computational Intelligence and AI in Games, as well as an Associate Editor of nine other journals. I hold (or have held) several Directorship on various companies. Prior to entering academic , I worked in industry for almost 20 years.